It has been over six months since I took that memorable journey to Laya. I found treasure house of stories to blog about. I have put them all in chapters in my head, chronologically. So much water has flowed under the bridge since and I am still stranded in Laya as a blogger. I couldn't move on without having done telling the stories I held so dearly inside me. Perhaps, it's time I let go and set myself free with this last story. If I ever regain the right kind of emotion I might come back to continue from where I left. Among the many stories I heard on my way to Laya and back, my Oscar goes to this story about Ap Phub and his bridge. I was lucky to be in the company of local boy Dasho Sangay Khandu while passing through the setting of this story. 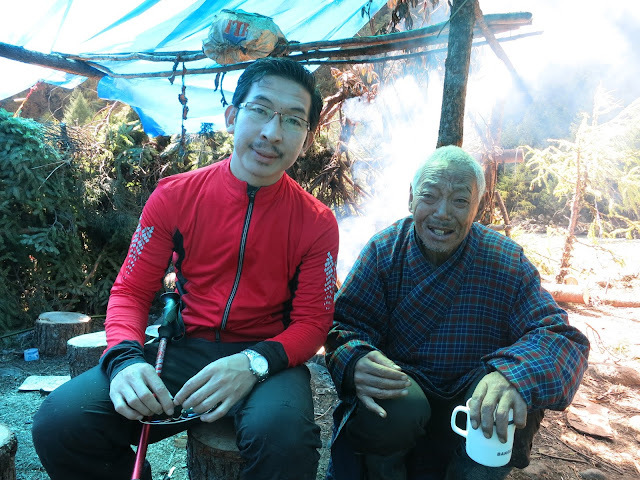 A decade later this story will be told as a legend or even a fairy tale but I was lucky to have met the man himself right after I heard the story from Dasho. It was like meeting the actor at the end of the movie. Eight years ago Ap Phub, known in Laya as Khadhip Phub, won the contract to build a wooden bridge over river Mo Chu on the way to Laya. It was perhaps a mistake on his part to dare the project at all, because that section of the river was wide and the temporary winter bridges never survived to see the summer. Therefore, for ages people have been taking an additional hour of detour over the mountain in the absence of the bridge during the summers. Ap Khadhip wasn't so clever to understand why people weren't competing against him. The old man began the construction and invested so much in labour and resources. He did it. He completed the difficult bridge. But before the Dzongkhag officials could come to assess his work his bridge was washed away by the river. It wasn't anything to be surprised about. It happened each year. However, because it was a contracted project he couldn't receive his money without a bridge to show to the officials. He only had witnesses to validate that he had done the job but without a visible bridge over the river the officials had no basis to pay him. Any other man would have fought for the money differently, most probably in the court but this old man went back to the bridge site and began working again. Putting in his own money. Only to watch his new bridge wash away before the completion. Many travellers who passed through this route had seen him working on the bridge, year after year, sometime with some help but mostly alone. He began living in the cave near his worksite. It became his home. 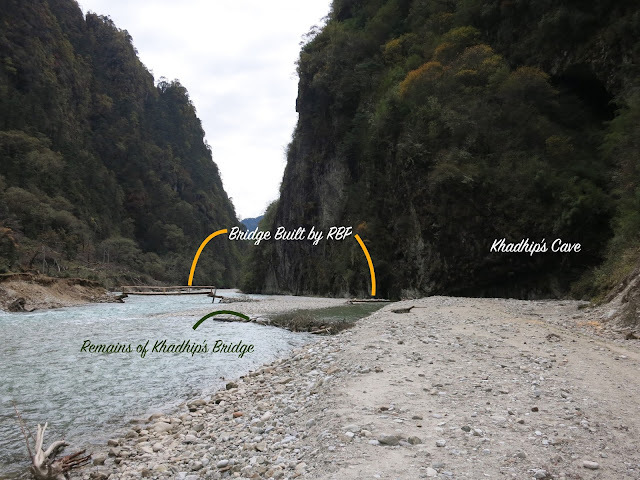 In last eight years, government has changed, Dzongda has changed and perhaps most of the official in the Dzongkhag must have changed but he couldn't yet handover his bridge and claim his bills. Perhaps even if he did complete his work now, there won't be anyone to take it over and pay him his bills. Yet he is there, forever working on the bridge. It's said that his story even got Royal attention and he was granted soelray by His Majesty the King. He was asked to go back home and take rest. He went back home for a while, only to return to his cave and work on his bridge. There seemed to be reasons beyond money for him. When we were travelling to Laya there was a bridge over the river constructed by Royal Bhutan Army for the festival. Close to the new bridge we could see the remains of his fallen bridge. His cave was empty that day, because he has gone ahead of us to be at the Highland Festival. We met him eventually at the next camp. Perhaps he must have seen the soldiers built the new bridge; what must have gone through his mind? Would he have finally found peace having seen a bridge over the river? Because I feel that it's no more about the money, it's about seeking inner peace and nursing his wounded pride. It's about honour. I would love to know if he ever came back to his cave after that. I am sure there must be a term for this special condition but I would love to call this the Khadhip syndrome. I wish we all had this syndrome, especially those people in important positions, entrusted with important national tasks to become obsessed for honour than recognition or money. Disclaimer: If there are some factual errors or missing information, it's because of the 6 months that has come between me and the story. If friends who know about him find any mistakes kindly let me know. Is this bridge located over the river that is just after Koina? Yes Aue Yeshey, but no that last one. There are three bridges within that short distance, and his bridge is the middle one. This is a beautiful story. Thank you for sharing these extraordinary stories of amazing people from all walks of life. I look forward to more. This story made me remember those previous years when I was reading the book "The Old Man And The Sea" by E. HEMINGWAY. A story of dedication, determination and power of a man. I respect you, Sir Passu. And the hero of this story. Sir, its wonderful story. It give a big moral that never give up. Inspiring story indeed. Moved me almost to tears by the man's dedication towards his duty. 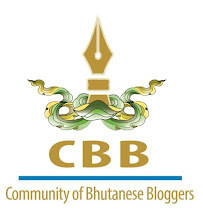 I wonder if the Dzongkhag can arrange to compensate him and his hard work. I think his memory is evading him. Poor guy. I think his story began somewhere in 1999-2000 and not 8 years ago. I remember meeting him in 2004 when I was filming in the area. A very inspiring story. We need more of such dedicated souls in Bhutan.